Showing results by author "Diane L. McKay M.D"
It's time to turn back the clock! 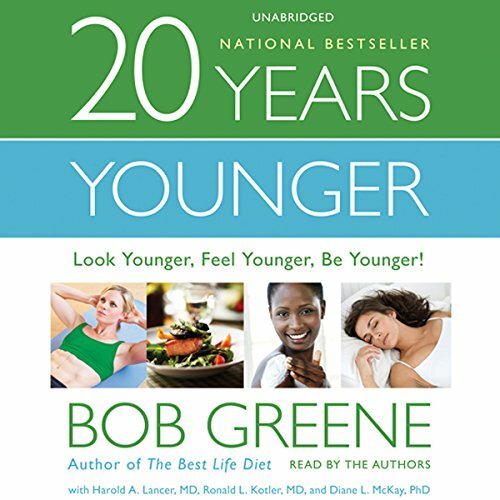 In 20 Years Younger, Bob Greene offers listeners a practical, science-based plan for looking and feeling their best as they age. The cutting-edge program details easy and effective steps we can all take to rebuild the foundation of youth and enjoy better health, improved energy, and a positive outlook on life. The four cornerstones of the program are: an exercise regimen for fighting muscle and bone loss, a longevity-focused diet, sleep rejuvenation, and wrinkle-fighting skin care. By: Bob Greene, Harold A. Lancer M.D., Ronald L. Kotler M.D., Diane L. McKay M.D. Narrated by: Bob Greene, Harold A. Lancer M.D., Ronald L. Kotler M.D., Diane L. McKay M.D.